Then Jesus shouted, "Lazarus, come out!" 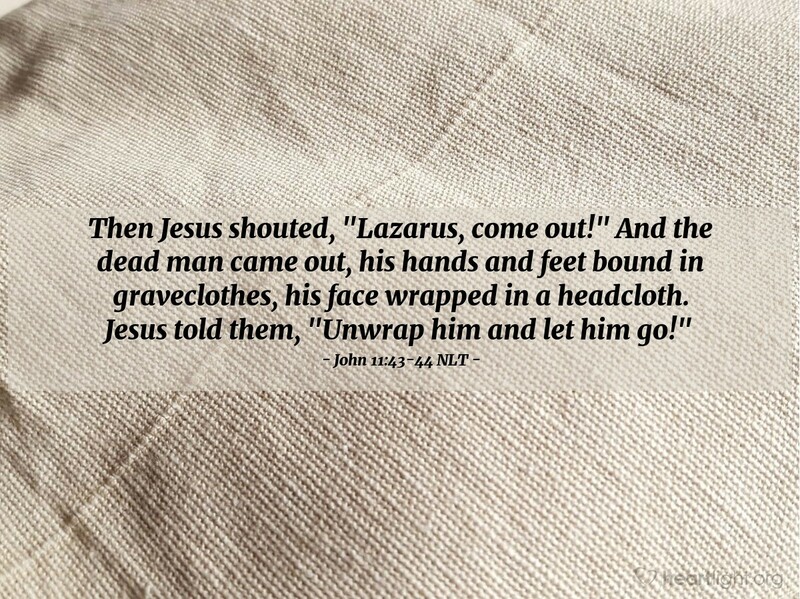 And the dead man came out, his hands and feet bound in graveclothes, his face wrapped in a headcloth. Jesus told them, "Unwrap him and let him go!" I love Jesus' words, "Unwrap him and let him go!" Death cannot bind Lazarus anymore, so don't let his graveclothes bind him either! Think of the power of Jesus' directions on those standing by watching! One day, Jesus will speak our names, call us to himself, and forbid death to bind us. Lazarus is a great example of what we anticipate — receiving back those who have died and gone before us and receiving our call to be set free from the demands of a mortal body. Lazarus is a great reminder that we are free from the power of death to hold us captive! Lord God Almighty, the Father of all that lives, thank you for giving us back what we throw away with sin. Thank you for the assurance that I will be united with those that I love who have died in faith. Thank you for the assurance that death cannot hold me captive. In Jesus' mighty name, I pray. Amen.